When it comes to sweet deals on used trucks for sale, we have the perfect pickup truck for summer adventures: a used 2014 Chevy Silverado 1500 LT. There is nothing quite like a pickup truck for fun road trips. You can easily tow camping equipment for a weekend in the mountains or haul endless bags of mulch from Home Depot for landscaping tasks. The point is, behind the wheel of a pickup truck, you are empowered to do pretty much anything. Even better, you don’t have to break the bank to drive away in an award-winning, capable, and efficient pickup truck. 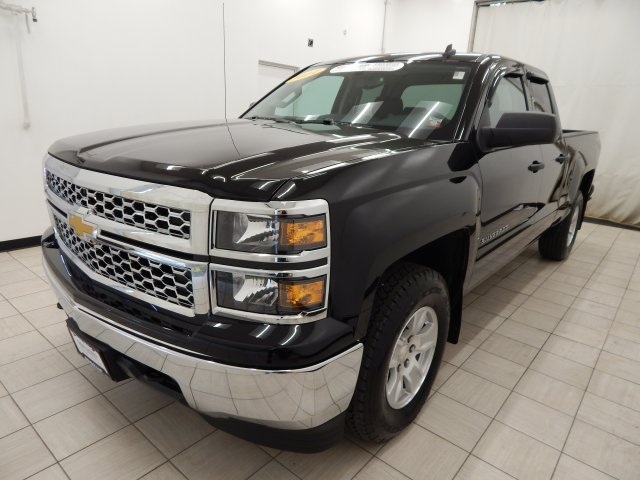 Take a look at this 2014 Chevy Silverado LT, priced at just $31,989 and absolutely loaded, with four-wheel drive and all sorts of fun and useful features. This four-door double cab with stunning glossy black exterior has only had one owner in its past and comes with a squeaky clean CARFAX report. Better yet, you’ll get even more coverage because all of our DePaula pre-owned vehicles undergo a 172-point inspection and oil change before they are ready to hit the sales floor. With only a little over 12,000 miles on it, this truck boasts an EPA-estimated fuel economy of 22 highway and 16 city miles per gallon, which means you’ll be making fewer stops at the pump this summer. Equipped with an improved and competitive EcoTec3 5.3-liter V8 Flex Fuel engine, operated by a six-speed automatic electronic transmission with overdrive, this particular pickup truck drives like it’s brand new and packs a whopping punch of 355 horsepower. When it comes to towing that camping equipment, this Silverado has a maximum rating of 12,000 pounds. Although Chevy considers the LT its mid-level trim, we think this truck offers more than you might expect from something in the middle range. On the exterior, the LT features alloy wheels, and a chrome grille insert along the front. In the back, you’ve got Chevy’s EZ lift and lower tailgate, which is conveniently situated and makes the cargo bed more readily accessible. For the 2014 model year, Chevy upped the Silverado’s interior and added some nice new features. Most importantly, the changes enhanced the truck’s structural stiffness, making it more secure in a crash. See the safety ratings below for more details on that. Between better quality materials and plenty of additional storage spaces of all sorts of sizes, the Silverado also keeps you connected with its USB ports and Chevy MyLink infotainment system, broadcasted on an eight-inch touchscreen display. Drivers who have used the MyLink report that it is super responsive and easy to use, thanks to the clearly organized menus. 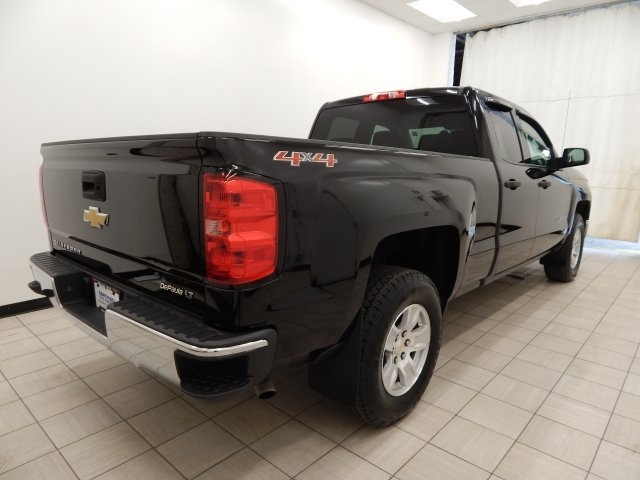 With this particular 2014 Chevy Silverado 1500 LT, you can try some of Chevy’s available infotainment systems, like a three-month trial of OnStar Directions & Connections Service, which offers navigation assistance, and a three-month trial of SiriusXM Radio. The interior is covered in cloth upholstery, complemented by soft carpeting and more padded seats, ideal for those long, cross-country road trips. The driver’s seat offers adjustable lumbar support. The steering wheel is wrapped in leather with audio controls built in, allowing you to control the sounds coming out of the LT’s six speaker audio system. 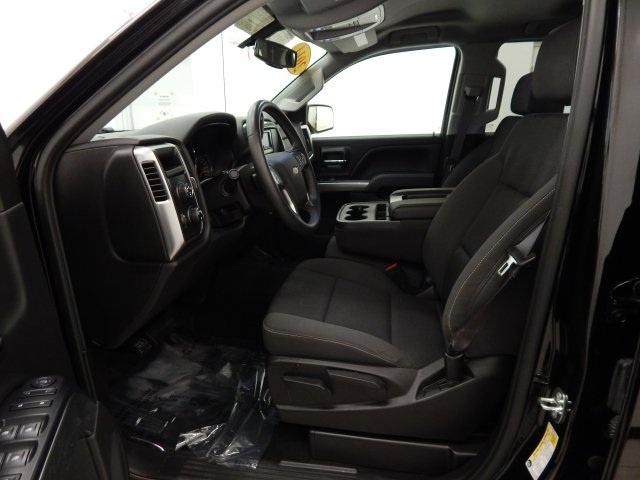 Though technically unchanged in size, the 2014 Silverado’s polished up interior actually creates more legroom for backseat passengers, while those seated in the front are treated to a wider range of forwards and back seat adjustments. For the first time in the pickup truck segment, the Chevy Silverado received a five star overall safety rating from government crash tests, specifically on the total frontal-impact and total side-impact tests. Powerful though it is, this truck also has great stopping speed. In Edmunds’ brake testing, the Silverado was able to stop from sixty miles per hour in 128 feet. Equipped with passive and active safety features like traction and stability control, antilock disc brakes, and an array of standard airbags, front and rear seat side, and side curtain, this LT also has the standard OnStar safety system. In the unfortunate event of an accident, the OnStar system automatically sends a crash notification to an OnStar dispatcher, who can then contact emergency services in case you are unable to. The LT’s doors lock and unlock remotely, and this truck also comes with roadside and stolen vehicle assistance. All DePaula pre-owned vehicles come with extended service contracts and possible available finance specials. This current offer is an outstanding deal, especially considering that it was assessed as being worth more than its sticker price. Act fast because this truck is sure to attract a buyer very soon. Or, if you like this truck, but would prefer a different color option, check in with our sales team. The 2014 Silverados were released in an impressive exterior color palette, with plenty of variety from shades like Deep Ruby Metallic, Blue Granite Metallic, Silver Ice Metallic, Summit White, Black, White Diamond Tricoat, Victory Red, Blue Topaz Metallic, Brownstone Metallic or Tungsten Metallic. The 2014 Silverados also came with lots of customization and package options for you to consider, like the All Star, Texas, and Custom Sport editions. And there are other trim levels to consider, too. Starting with the base work trucks (1WT, 2WT) and moving up to the LTZ or all the way to the top-of-the-line Z71, the Silverado is available in three body styles: regular cab, extended or “Double” cab, and crew cab. Depending on the body style, you can opt for whatever size truck bed you need, with options including the 6.5-foot standard or 8-foot bed, with a 5.75-foot short bed available on the crew cab.